If you thought the Nina Ricci shoes back in Fall 2009 was crazy, this one definitely takes the cake. Speaking of which, I could so use this shoe to kick/stomp on the incredibly rude driver I met at the carpark of the supermarket just now. It was crowded but people were waiting patiently for cars to empty the slots. This stupid driver basically zoomed right into an empty slot me & dad were waiting for (we were right next to the slot waiting for the previous driver to drive out), got out of the car with her parents, looked at us (I was totally staring at her at this point) and proceeded to walk off with (I swear!) a smirk on her face! No remorse! Gosh, we were so pissed off I tell you. Not to sound evil or anything, but I was definitely wishing bad things on her until I remember the phrase what comes around, goes around. I'm sure she'll get it one day. Amen. Anyway, where was I? Oh yes, the picture. Such an amazing shot don't you think? You can view the complete editorial here. I have this morbid idea that her feet are all mangled inside.. scary! 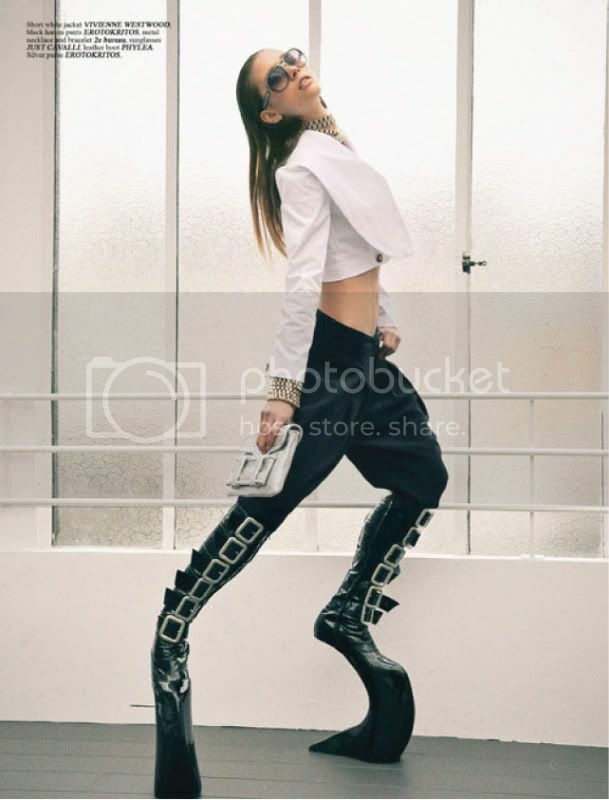 lol..it's e shape of the shoe for sure..i duno, she kinda looks like she's melting into the ground?